The EIDXMP Series of Ethernet switches provide management functionality in situations where extended temperatures of -40°C to +75°C are expected. With a fixed width of 62 mm, these units offer 16 or 24 ports with copper and fiber/copper combinations. 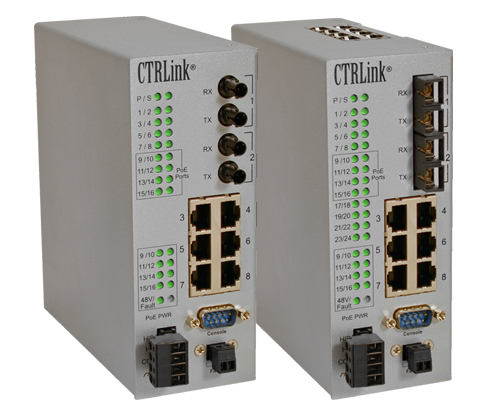 Ports 9 through 16 (located on the bottom of the unit) support Power-over-Ethernet (PoE), providing data and power over one cable. The unit acts as power source equipment (PSE)-supplying up to 15.4 W per port for IEEE 802.3af-compliant powered devices (PD). PoE eliminates the need for additional power supplies for Ethernet-enabled devices placed in challenging locations-such as wireless access points or IP cameras on a ceiling or outdoors. PDs can be located up to 100 metres from the switch. In addition to the conventional features standard in Plug-and-Play switches, the EIDXMP Series offers many important managed-switch benefits. These benefits includes IGMP snooping and IGMP query, RapidRing®, VLAN, Quality of Service (QoS), port mirroring, rate limiting, trunking, port security, the Simple Network Management Protocol (SNMP), and the Rapid Spanning Tree Protocol (RSTP). Configure the unit by web browser via any Ethernet port-or in terminal mode via the local console port. Using either of these methods, port parameters, feature configuration and device status can be monitored and/or modified. A configurable relay is present for attaching to fault-monitoring equipment. The Automation Switch is available in eight models-two all-copper and six copper/fiber. fiber support includes multimode fiber with either ST or SC connectors or single mode fiber with SC connectors. fiber port data rates are fixed at 100 Mbps full-duplex while all the copper ports can auto-negotiate data rate from 10 to 100 Mbps and from half- to full-duplex. Both the 16- and 24-port models have eight ports on the front and eight ports on the bottom while the 24-port model has an additional eight ports on top. The PoE ports are all located on the bottom. Copper ports utilize shielded RJ-45 connectors. An abundance of LED indicators are available for monitoring switch status, port status and PoE status. The unit can be either DIN-rail or panel mounted and must be powered from a 48 VDC isolated power supply. The switch electronics and EIA- 232 console port are isolated from the DC supply. A N.O. contact is available for signalling a fault condition to external equipment.